It’s time for another very cool top ten list by The Broke and the Bookish. This topic is a new way to talk about underrated books, especially when calling a book underrated is subjective. An easy way to figure out your own list is to go to Goodreads, select your “read” list, and at the top of your read list where it says “settings,” you can add a column for “# of ratings.” From there, you can sort your list from least to most ratings. Have you heard of or read any of the books I mentioned? I’d love to talk more about them, especially because they are so very deserving of love and attention! What's in your Top Ten Tuesday? IN THE SHADOWS! I allllmost put it on my list but I reviewed it earlier this year. It's so great. It was really one of my surprise books when I read it because I had no idea what to expect, and it's not the kind of book I would seek out on my own. I am lowkey obsessed with that books. It is phenomenal, and very original. I wish more people knew about it! They are! You should absolutely add them to your TBR. Thanks for stopping by, Lauren! I'll be sure to check yours out next. A Curious Tale of The In-between has been on my radar for a while. I must read it! It's such a good book. It made me a fan of Lauren DeStefano. She also has a great twitter presence. A Curious Tale of the In-Between is definitely on my TBR. I read MG to my son at night and it's our favorite time of the day together, so I'm always on the lookout for good MG :) I'd also like to read This Monstrous Thing... I've never read a Frankenstein retelling, but I really loved reading Frankenstein in college, so I'd like to try one. Great list! Ooh, that sounds so lovely, Michelle! If you guys like middle grade, the book Pip Bartlett that I mentioned is very cute. I've definitely heard of Ethel and Ernest. Such an interesting idea for a children's book, I think. I like how we are taking a close look this week at books that have been deeply underrated. Thanks for sharing yours! Here's my Books I Enjoyed That You Might Have Missed! Thanks for stopping by, Deb. I'll be sure to check out your TTT as well. 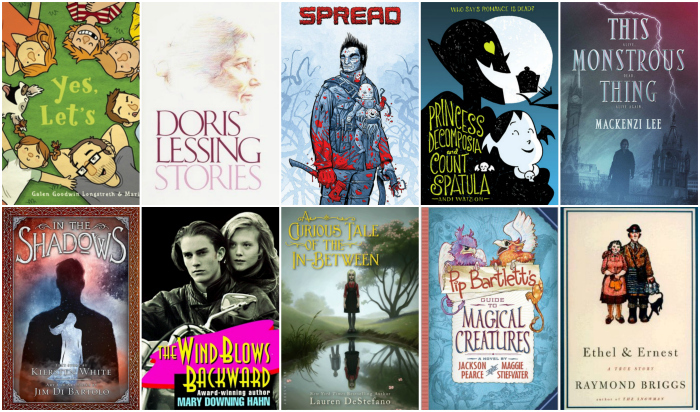 Like you, I had a lot of Middle Grade on my list! I included Cat Running, Three Terrible Trins, and Spying On Miss Muller. All wonderful, little-read MG books! I hadn't heard of those before, but now I am very interested. I will go look at your TTT list for more, thanks! Allyson, what are you waiting for?! Go read it now! This Monstrous Thing seems to be making lots of appearances on people's lists. It wasn't on my radar before but it certainly is now. I'm so glad, Liselle! The author, Mackenzi Lee, is really active on twitter and friendly with her readers, too. In the Shadows looks really good. I feel like I've seen it somewhere before. Will definitely have to check it out! Princess Decomposia and Count Spatula looks like a lot of fun, too. Here is my list of underrated books. In the Shadows is a hybrid of prose and illustrations. So good! I'll be sure to check out your list, Kasey!